These nine CDs contain Parisian broadcast material made by Horenstein and the ORTF National Orchestra between the years 1952 and 1966 – but see the note about the Barber Concerto for a dating query. The value of such a box to admirers of the conductor can hardly be underestimated given the very uneven nature of his recorded legacy. At a stroke ten and a half hours has been added to the canon, three quarters of which has been previously unpublished. As the box cover notes with understandable pride, seven hours is new to the market. Given this bulk of material there are necessarily caveats to be noted. The sound quality varies. It never sinks below a certain level but equally it’s seldom really outstanding and compresses the spectrum more than one would like. The orchestra, true to Parisian custom, is a temperamental beast, sometimes playing with highly mercurial effectiveness and then suddenly slumping to the depths, though to be fair such an event is a rarity and more of that Janáček disaster later. 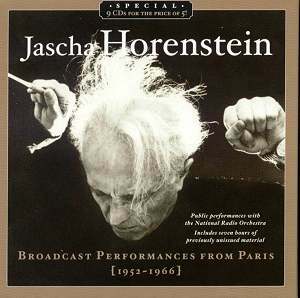 Still, these are rare opportunities to hear Horenstein in Paris and not to be spurned lightly. The Ravel Concerto with Monique Haas suffers from occasional orchestral impressions but is otherwise a strongly effective reading, the slow movement unfolded with sensitivity but sufficient spine. Tumultuous applause greets the end of Bolero. Beethoven’s First Symphony is a fiery and trenchant occasion in Horenstein’s hands. The slow movement is aptly flowing and the finale gutsy – pungent tuttis included. The Seventh Symphony (1966) is rugged and determined with the Allegretto taken at a fine clip. If the finale opens with rather over-military gestures Horenstein is saving his powder for the rousing closing moments. The Eighth Symphony performance dates from the beginning of the sequence of broadcasts – 1952 – and receives a reading of unusually tense and big boned power. There’s a performance of the Ninth from October 1963 and to be heard in decent sound. The soloists are all in good though not outstanding form and Horenstein’s fluid, accelerando-driven first movement brings its own excitement levels. Music and Arts has also put out a Monteux Ninth from Paris in 1958 which is altogether less prone to tempo extremes. The Roussel, given at the same concert as the Beethoven Seventh, is evocative and sensitively done. The French accent meted out to Bartók’s Concerto for Orchestra gives the performance an individualism lacking in more cosmopolitan readings. There’s a rugged, sometimes ragged power here and the winds’s vibrato gives things a throaty context. Horenstein drives far into the expressive hinterland of the Concerto – a fine reading. Horenstein is better known for his Nielsen than for his Sibelius but the latter’s Second Symphony is here. This takes time to warm up and does keep hanging fire even so but tension is whipped up in the climaxes. One might expect a Parisian orchestra to be au fait with the Firebird. Horenstein was clearly a splendid Stravinsky conductor bringing great warmth to the Ronde des princesses and reserves of incision to the Berceuse. The wide vibratos of the wind players make their presence very audible throughout this charismatic reading. The Symphony in Three Movements is both excellently projected and tremendously insightful. Horenstein doesn’t stint elegant phrasing but nor does he undersell the rhythmic drive. Cogent impetus drives this forward. The occasional limitation of some of Horenstein’s performances is a quality of unevenness within a work and sometimes between movements. Debussy is represented by La Mer and this oscillates between these points – a touch heavy handed in places but with powerful and surging climaxes. Mendelssohn’s Fourth Symphony is brisk but not unyielding. The no-nonsense drive extends to a biting Saltarello. Brahms’s First Symphony is powerful though is prone to poor horn intonation and to rhythmic sagging in the finale. Mahler’s Kindertotenlieder features Marian Anderson. Her voice is richly communicative and her instincts are, as ever, thoroughly sympathetic but the performance is sabotaged by her constant pitching problems. Turning to the 1961 performance of Strauss’s Metamorphosen is to hear Horenstein in a full flood of expressive commitment. This grave and yet beautifully balanced reading is one of the highlights of the set. Janáček’s Sinfonietta is a bit of a disaster all round. Brass intonation is often non-existent; the playing is cartoonishly slow in places and often downright chaotic. Best to pass on. Haydn’s Military Symphony is fresh and imperial and full of controlled verve – a decisive and exciting example of Horenstein’s way with this kind of repertory. Lola Bobesco appears in the Barber Violin Concerto in a concert given in November 1950 – which, if true, means that the box’s coverage extends back by two years. In any case this is a terrific performance – fiery, passionate, full of colour, expressive devices and Bobesco’s wholehearted command. Then there’s Prokofiev’s Fifth Symphony which is, in these hands, profoundly Mahlerian with driving and brazen moments balanced by paragraphs of grace in the string moulding. So for all the relative demerits this is a most valuable set. It collates important repertoire and allows one to hear a mass of performances, with the same orchestra, delivered over a significant period of years. Joel Lazar’s notes make for insightful reading. The box itself offers plenty of food for thought regarding the breadth and depth of Horenstein’s musical affiliations.